NEW YORK (AP) -- The maker of the BlackBerry is running out of time. Research In Motion Ltd.'s stock fell to a nine-year low Friday, a day after the Canadian company said phones running its upcoming BlackBerry 10 operating system won't be available until after the holiday shopping season. Sales of the once-pioneering BlackBerry phones, which now look ancient next to the latest iPhones and Android devices, fell 41 percent in the latest quarter and likely won't pick up again until new phones come out. — This fall, Apple Inc. is expected to release a new iPhone with an improved Siri virtual assistant. It promises a new mapping service that sports voice navigation. — Samsung and other phone makers are continually selling new models that run Google's Android operating software. The next version of Android, expected in mid-July, will have improved search and photo sharing. — Phones running a revamped version of Microsoft's Windows system are also coming this fall. BlackBerrys were once a staple in corporate environments because of their reputation for security and reliability. People pulled them out to check email in restaurants, living rooms and vacation homes such that they became known as "CrackBerrys." When he became president, Barack Obama refused to part with his BlackBerry despite worries about emails sent through it complying with public-record laws. But BlackBerrys lost their cachet when iPhones came along and demonstrated that smartphones could be good for more than email. People could now watch movies, play games, read books and update their Facebook statuses easily. Outside software programmers started spewing out apps to extend the devices' functionality and popularity. 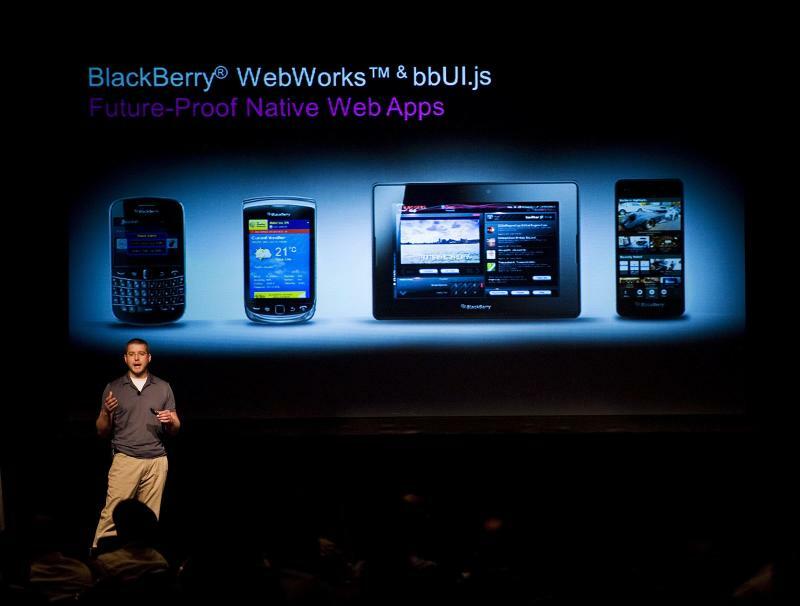 RIM portrays BlackBerry 10 as its way of catching up. It promises the multimedia, Internet browsing and apps experience that customers now demand. RIM unveiled it last October, long after BlackBerrys began to slip in stature. Analysts had hoped to see BlackBerry 10 phones by early 2012, but RIM said in December that they won't be available until late in the year because they needed a chipset that wasn't available yet. Now, RIM said the phones won't be out until 2013. With yet another delay, BlackBerry loyalists may not be willing to wait longer. Already, the BlackBerry's U.S. market share has plummeted from 41 percent in 2007 to less than 4 percent in the first three months of 2012, according to research firm IDC. "The possibility of a comeback is rapidly diminishing," analyst Steven Li at Raymond James said in a research note. He added that the delay also could discourage outside software developers from writing BlackBerry 10 apps that rival the thousands available for iPhones and Android devices. Sterne Agee analyst Shaw Wu said RIM's main concern should be "more about staying alive. We believe the company needs to be careful with its cash or risk facing bankruptcy." The company has hired J.P. Morgan and RBC Capital Markets to help evaluate various recovery plans, including opportunities to partner with other companies and license software. The company has said it's not actively looking to sell itself, but it wants to be prepared. Most analysts have started looking at RIM not as a company with a future but as a collection of parts that could be split up and sold separately to the highest bidder. RIM's portfolio of patents is particularly valuable in a climate where Apple and other phone makers are suing each other over the originality of phone designs and techniques. RIM disclosed the BlackBerry 10 delay after the market closed Thursday as part of its quarterly earnings report. RIM's stock fell $1.74, or 19 percent, to close Friday at $7.39. That's the lowest price since September 2003. RIM did not return messages for comment Friday. RIM's revenue fell 43 percent to $2.8 billion in the latest quarter, which ended June 2. Besides selling fewer phones, RIM tended to sell less-profitable models and had to offer discounts in the U.S. to stem consumer defections. RIM also had a higher proportion of subscribers on lower-cost plans, meaning less revenue from email, messaging and other services offered through those devices. Gross profit margin in the quarter was 28 percent, compared with 44 percent a year ago and 33 percent in the previous quarter. To make up for that, RIM is looking to cut $1 billion in expenses this year, which will include a 30 percent reduction in its workforce. During a conference call with analysts Thursday, RIM CEO Thorsten Heins said the company is expecting the next several quarters to be "very challenging." Analysts at Nomura Securities said management appears to be pushing price cuts as a way to keep people buying BlackBerrys until the new system "comes in to save the day in 2013." But that strategy, he said, is one that "has a very low likelihood of success and that will most likely drive RIM into irrelevance."